Lyon, third largest city in France, is situated roughly between Paris and Marseille in the Central-East Rhône-Alpes region. It’s at the meeting of two major rivers (the Rhône and Saône) and currently both regional capital and capital of the Rhône region. It’s also relatively close to Geneva in Switzerland and Turin in Italy. 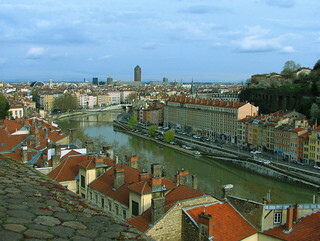 In the past Lyon was best known for the production and weaving of silk, whereas now it’s best associated with gastronomy, French cinema and football (soccer). It’s also a very important business and economic centre – 2nd in France. 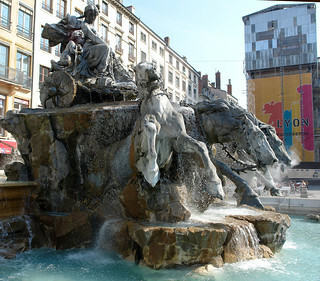 Lyon has been a UNESCO World Heritage Site since 1998 due to its many historical and architectural landmarks. 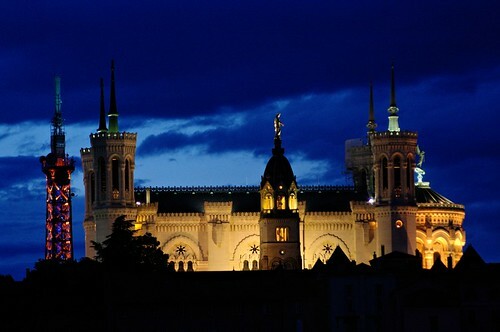 From its beginning as a Roman colony on the Fourvière hill when Lyon was known as “hill of lights”, it became the capital of Gaul and was the location of great Roman persecutions of Christians. Lyon only became French in the 14th century. Lyon was the major banking centre of France in the 18th century. The city was partly destroyed during the French Revolution but then rebuilt on the orders of Napoleon. The most exquisite old residential buildings of Lyon are at the Place Bellecour on the Presqu’île between the two rivers. Take a slow walk through the original medieval city (Vieux Lyon) on the west bank of the Saône. To the city’s west, visit Fourvière and the wonderful basilica of Notre-Dame de Fourvière, then the palace of the Archbishop, eventually enjoy a trip on the funicular railway. Lyon became famous as an anti-German resistance centre during the WW2 occupation of France. A fantastic resistance museum and the traboules (secret passages through houses to escape Gestapo raids) are still present today. For local flavour, the Croix-Rousse to the city’s north is still the traditional home of many small silk workshops. The Musée Lumière, celebrating the Lumière brother’s pioneering of cinema in in 1895, contains many early cinematographic exhibits within an architecturally impressive building. you can also visit the free zoo at Lycée du Parc within one of Europe’s largest open urban spaces, Parc de la Tête d’Or in the 6th Arrondissement in the city’s North. For modern Lyon, east of the Rhône from the Presqu’île is the urban centre of Part-Dieu. The tower (Tour) Part-Dieu (a.k.a. the “Pencil”), the Tour Oxygène, Lyon Part-Dieu 9One of the two major rail terminals) and a grandly wonderful shopping mall are all within easy walking distance. France’s most famous wine growing regions are both near Lyon (Beaujolais to the North and Côtes du Rhône to the South:) The city’s famous morning snacks, the mâchons, are made of local bacon, confit, ham, terrines, galantines and pâtés, and are traditionally drunk with a glass of Beaujolais. Also make sure you sample Cervelle de canut (silk worker’s brains), a cheese spread made with fromage blanc, shallots, chopped herbs, olive oil and vinegar.